With over 350 registered members, the UNL Web Developer Network (WDN) is one of the largest organizations of its kind in higher education. WDN members collaborate on the development of the UNL website. Mobility. Validity. Accessibility. UNL websites must work on all devices, display correctly within all standards-compliant browsers and render access to all users. We also value the advantages that come with unity in design frameworks and consistency in navigation. UNL is the only Research 1 (research universities with very high research activity) university with a unified web presence. Collectively, WDN members are responsible for over 1,200 sites and a half million pages, all built using a single consistent framework. We can pool our efforts and resources in a way that no other major university can. When we push out a new upgrade, all sites benefit; around 50 times a year, we push out improvements to all sites. 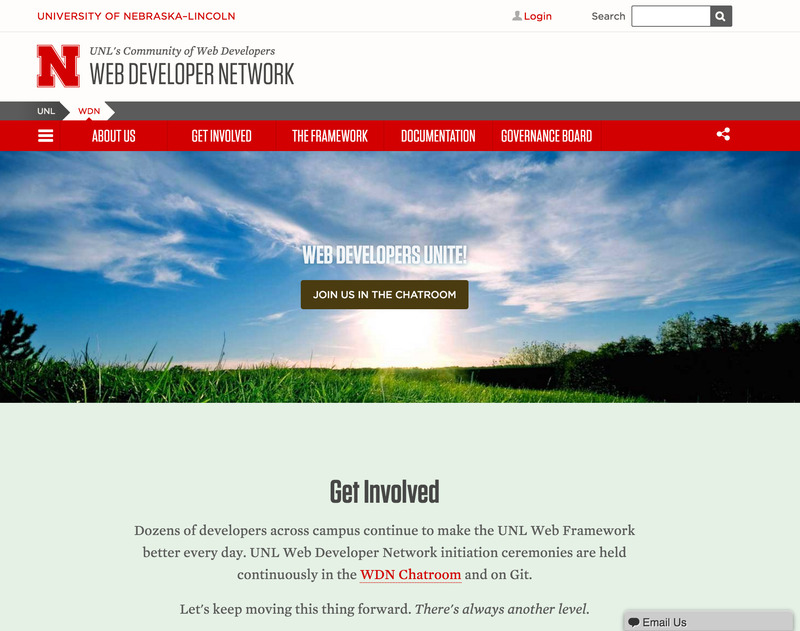 Standards for website development at UNL are established and governed by the UNL Web Developer Network, UNL’s primary organization of web developers. Use of UNL templates is mandatory for all websites at the department/unit levels and above as of August 2007. For websites below the department/unit level, use of UNL templates is not required, but if UNL templates are used, all requirements governing their use apply. Those sites below the department/unit level which do not use the templates provided are still required to meet Section 508 accessibility standards, be composed with valid code, use the official UNL favicon, and display either the UNL logo or Nebraska N linked to the university homepage. Training in the use of UNL templates is available. The class is a 2-hour hands-on lesson in building webpages using the UNL templates. A documentation wiki and Style Book provide both technical and content-related guidance on implementing your site in the UNL web templates. All template-based websites must be approved by the WDN Quality Assurance Review Team prior to being placed online as live sites. In addition to a monthly meeting, the WDN provides a bulletin board and always-on chatroom for support and general discussion.